It’s been rather a hectic week and then to add to the long to do list, yesterday morning I awoke with the brainwave idea of posting an online Christmas card. Rallying the troops at breakfast, I promised them it would be five minutes only; just a quick photo I promised. Nearly an hour later we gave up and reconvened after lunch for take two! Take one had started well, it was outside and all the chickens were pecking at grain I had scattered around our feet. Clara, one of the cats was the first to jump ship. Rory, the other cat, then managed to struggle free, at which point a quivering Evie leapt straight out of Hetty’s arms and set off in hot pursuit. By now the chickens had finished the grain and had no interest at all in any more and to my horror they all wandered away clucking their disdain. We were left with a grumpy Bentley and one hen! 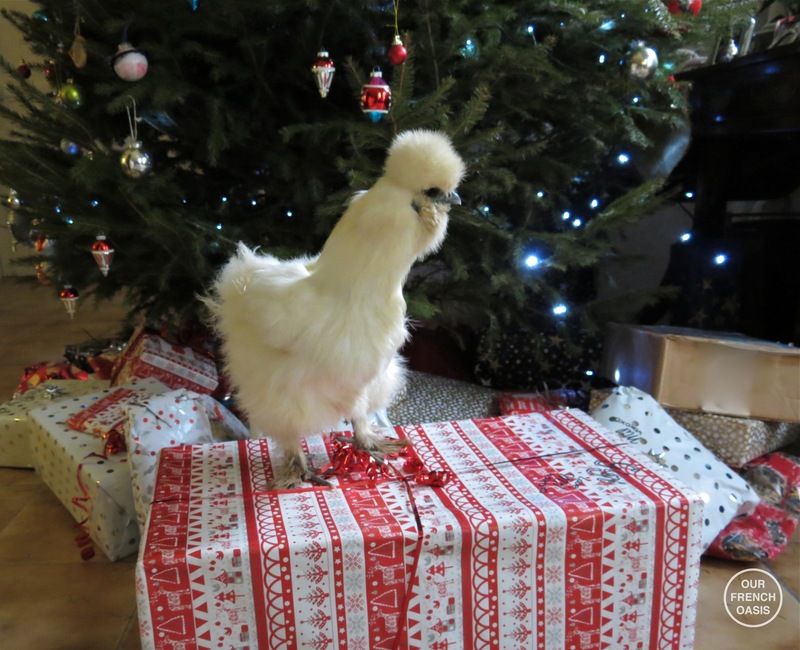 We changed tactics for take two and decided we would be better indoors, it started well with Rory in the shot, but he got bored again very quickly when Evie thought it was time to play and Constance, the Silkie, was left to examine the presents on her own! I could go on for ages, but suffice it to say, it was one of the most complicated photos I have ever taken! However, my blog post today is all about words not photos, part one of a Christmas Story. Once more with the Cole family in the Dordogne, who you may remember from Halloween. I hope you can find a quiet moment, either by the fire or if you are in warmer climes, in the shade of a tree, to relax, read and enjoy and again a very Happy Holidays and Merry Christmas. I stared at her in surprise. “Sorry?” I had a mouthful of toast and marmite halfway to my mouth and gawped at her. “Um,” and I looked down the table for help at Tim and Simon, but they were engrossed in the search for a Christmas tree in the local classifieds. “Er, I think so – I mean, yes, why not. I’m sure we get them in France….” and I tailed off into silence as Emma gave me the disparaging look of despair for the fully un-informed. I fidgeted a little with my toast and wondered what was coming next. Katie glanced up from her i-Pad and said helpfully, “I’ll have a peep for you, Mum, hang on.” and she tapped away as Emma and I looked on. As I watched, I wondered how it was we were so lucky to have three healthy and vivacious children, all happy in their French lives and growing so fast into young adults. There was a shake of the head from Katie, “Nope, they’re very scarce in this department,” she announced. “Lots in the Aquitaine and east of us but quite rare here, Em-pom.” and she looked inquiringly at her younger sister. ”Why do you ask?”, and I realised that that was the sort of intelligent question I should have stated earlier. “Madame Tissot?” I asked, wrinkling my nose to express my ignorance. “My bio teacher, Mum. We’re doing mammals at the moment, remember?” There was a hint of exasperation in her voice. I had a sudden flashback to Emma’s attempts to photograph some birds on our garden feeder and as I did so I suddenly realised what a wonderful present I could buy her – something I’d seen in Gamm Vert the day before. The garden-centre had been groaning with Christmas gifts and food, plus a few other things. I grinned, and changed the subject. “How about I ask someone in the village about otters when I go in this morning from some bread?” I said, and I watched as two young heads nodded in agreement. “Cool!” they both chorused like a pair of pigeons. I was heading out the door 20 minutes later, struggling into a jacket while holding an umbrella, when my phone started to chirrup in my pocket. I held back in the small porch-way out of the light drizzle and tugging it out I glanced at the screen. It was a UK number, and I hesitated to answer it, still not sure after all the years in France whether I paid for the call or not. It was the sort of question Simon and Tim would know the answer to. I stabbed the green button in a moment of decision and froze in shock as a voice I had not heard in several years squawked out of the speaker. “Sophie, darling? Is that you?”, a gravelly voice asked huskily. I pulled the phone away from my ear and stared at it in horror, a hand halfway to cover my voice in case I made a noise. “Sophie? Sophie? Can you hear me?” demanded the voice. “This is an awful line, and I can’t hear a thing, can you speak louder?” and at that moment Emma swung open the door behind me, singing “Good King Wenceslas” loudly at the top of her pipingly loud voice. Before I had a chance to hush her, there was another squawk from the phone, “SOPHIE! You’re there! Excellent, how are you all?” and I knew the subterfuge was over. “Hello Aunt Sylvie, how are you?” I replied cooly, and wondered what on earth this was all about. It had been seven years since I had seen my aunt, and apart from a letter or two and the odd Christmas card, she had been a virtual stranger to us since we had left London five years ago. I wondered briefly whether her husband, Vincent, had died. We had a brief conversation for several minutes and it became clear that Aunt Sylvie’s situation was quite the opposite. Vincent had run off with a younger woman from work, and Aunt Sylvie was on a downward spiral. There was an awkward pause after she finished telling me this, and I felt a tinge of pity. I stood there, open-mouthed, in shock myself. I had no idea what to say, and couldn’t instantly think of a single reason why this unhappy and relative stranger could not come to stay. I looked at Emma, who was looking at me. Her eyes bored into mine, and her mouth mimed the words, “Go on, Mum!” and I was reminded yet again of the unthinking charity of children. She nodded vigorously, affirmatively, and annoyingly, with virtue. “Sophie,” queried the voice, “if it’s too much trouble don’t worry, I’ll find a hotel or something.” and my heart swooped in pity. It was another ten minutes before I wearily put my phone back in my pocket and started down the road to the village, leaving Emma to go back inside and tell the rest of the family of the change in our Christmas plans. I hoped sincerely I had done the right thing, knowing full well that Simon might not be amused. Closing the door of the boulangerie behind me, I was immediately enveloped in the warmth of the tiny little shop. Smiling at me from behind the counter was Nadia, the baker’s petite wife, dressed casually as always with an apron dusted in flour, but at her ears were the most beautiful earrings I had ever seen, miniature works of art that bobbled and flashed in the bright lights. Nadia beamed at me as she pirouetted back and forth. She grinned with delight and her eyes filled with mystery and light. “They belong in my family,” she said. “The youngest married woman always has possession of them, as they are lover’s jewellery, filled with the romance of partnership and fertility.” She touched one gently with a finger. “They’re moonstone, Sophie, created from a piece of the Adula mountain’s in Switzerland, so family legend has it. Many years ago my family crossed the Alps from Romania during the first Great War,” and there was a flash of pride in her voice, “these earrings came with us – they are part of our heritage. So many people left Romania then.” and she seems to sigh at the vast tragedy of the missing years. I looked closely at the earrings as they danced in the light. Each was an inch-long tear-drop of gloriously shimmering delight, rimmed and banded with a thin filigree of rich gold which held a soft patina of age. They hung from Nadia’s delicate ears on fine chain, creations of such symmetry that they easily stood the test of time and its changing fashions. “I’ve never noticed you wearing them before, Nadia – I’m amazed,” I said. “Ah,” she replied, cheering up and twirling and dipping as she rearranged baguettes and boules, “that’s because we only wear them at certain times of the year and when we need a miracle to happen. Also for weddings, great religious days,” here she looked heavenwards, “and for when it is time to conceive,” and she looked coquettishly at me as she mentioned the last part. “OH!” I muttered loudly, “er, are you and Robert,” and my voice trailed off in surprise. There was a tinkle of laughter from Nadia, and she shook her head, the earrings sending beams of light twinkling around the bakery. “No, no – I am wearing these for our New Year tradition. In our family, we wear these throughout the last few days of December, and at mid-night on New Year’s eve we make a wish for something the family needs. I have to hold the earrings in my right hand, it is the rule.” She looked at me closely. “It may seem strange to you but for us it has always been this way. So much of the good things in our family’s lives have come true since my great-grandfather made these earrings. We have many stories to tell and anyway, as you know, Robert and I are very happy, this year” and she smiled at the ceiling of the bakery – I knew instinctively that their young six-month old baby was above, probably sleeping quietly. “No, I cannot tell you, Sophie, it is forbidden, but you know, my mother is…” and her voice trailed off into silence. I understood at once. Nadia’s mother was bedridden and ill. It would be an easy choice to make for a wish. I looked at her and nodded, “No, of course, you cannot tell me.” and she smiled. She shook her head and the light danced around the room again. We chatted for several more minutes, arranged for a bûche de noël, and I left, tucking my baguettes under one arm. It was only when I was halfway home that I remembered that I had forgotten to ask anyone about otters and our river. I sighed, and then remembered that there was something else to face when I got home – the reaction to Aunt Sylvie. 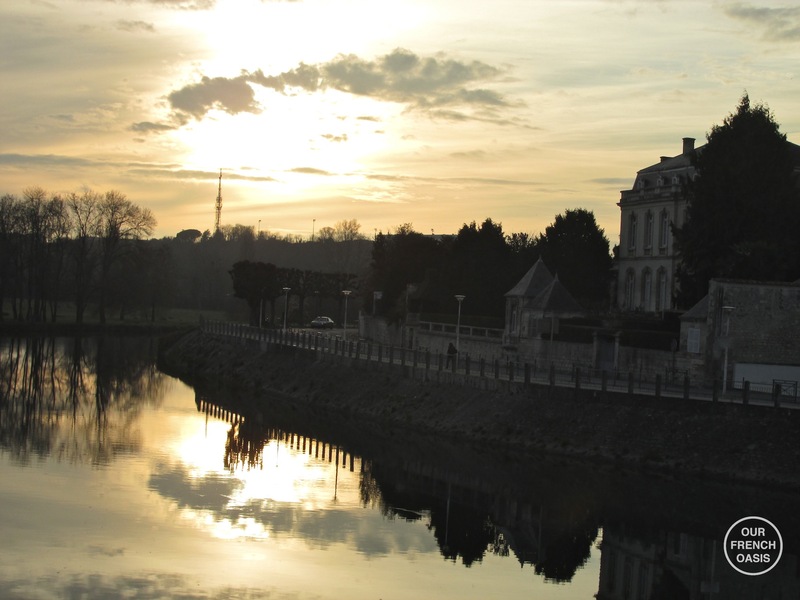 I drove to Bergerac three days before Christmas on an evening of poor visibility and low driving rain. It made the journey last longer than it should have done and when I turned into the airport I was already 20 minutes late, so chancing a quick swoop on the loop past the arrivals hall I hugged the curb and went slowly, looking for Aunt Sylvie’s diminutive frame in the dark night. There was no single individual, just a couple standing at the far end, sheltering back under the overhang. I was concentrating hard on not upsetting the taxi drivers when I came abreast of the couple and realised with a start that one of the figures was indeed Aunt Sylvie, and as I drew to a stop and lowered the window, they looked up and saw me. “Sophie!” called out my aunt, and she turned to her companion and they started to lift their two small bags to the car. I watched in horror, wondering who on earth she was with, as the sleeping arrangements Simon and I had carefully arranged began to unravel at speed in my mind. It wasn’t until they were actually at the car that I realised that the companion was a teenager, and then a split second later it all fell into place – this was Aunt Sylvie’s young grandson, once small and thin; now a young man with darting eyes and a lean face. Paul! I remembered his name the split second he opened his mouth to say hello as I opened the car door to get out and help, very aware of a taxi burning its headlights into the rear of our Citroën. “Hello,” said the young man in a painfully unsure voice, and then he was brushed aside as Aunt Sylvie came to greet me with a huge hug. I immediately thought that either I had grown or she had shrunk, for her small frame seemed so tiny and frail in my embrace. I looked over her head at Paul, and mouthed “Hello!” back at him as words poured forth into my jacket from Aunt Sophie’s head buried in it. I feared there was a tear involved, and hugged tighter, not knowing what to say as I really didn’t know her at all. Breakfast was a crowded affair on the first day of Aunt Sylvie’s stay. Tim and Paul sat at one end of the table, shoulder to shoulder, almost the same age but very different in build and character. We had put Paul on a camp-bed in Tim’s room and hoped for the best. Sylvie had slept well in the small guest room, and she sat between Katie and Emma, eyes darting brightly from one to the other as she listened to their chatter. Simon had eaten and gone already, off on a mission to find a couple of presents for our unscheduled guests. I stood making toast and poaching eggs, watching the scene with a worried frown on my face. I was aware that none of the children had taken much to Paul the previous day, and I was wondering how we were going to cope with what was only going to become a worsening situation. Emma had been very blunt when she burrowed under the duvet earlier for a cuddle. “He’s not very nice,” she’d said callously, and I thought of her charitable outlook three days earlier when she had been so keen to help. “He smells strange and he doesn’t look at you when you talk to him. He’s weird. I bet he doesn’t have a girlfriend.” She stopped abruptly as if she had finalised her summing up of the poor young man’s character. In a way I’d had to agree. For while Aunt Sylvie had proved to be a very different character as to how I remembered her, the grandson was quite the opposite, and I also hadn’t quite worked out yet why he was here and not with his parents. His mother, Erin, was my cousin, but I had not heard from her for years either. I struggled to remember what she did and a vague memory surfaced of a woman involved with charities; I then tried to work out respective ages and realised that while my cousin was approaching 40 or so, Sylvie must now be about 65. She was definitely a younger aunt than I remembered. Lying there with Emma, I’d made a mental note to find out why Paul was here and I decided that the breakfast table was a good time to ask; wandering round to my aunt I pitched my voice slightly over the hubbub as I posed the question, leaning gently towards her. She popped her head round to me and in a hesitant and awkward tone explained that Erin and her husband had flown out to the Philippines to deal with some tremendous floods the previous week. “She speaks good Spanish, you see,” Sylvie added. “She’s quite high up now at work, a director or something.” I had a vision of a photograph I had once seen of my cousin and her husband, perched atop a lorry in some ravaged land, and thought fleetingly of how shallow our lives were in comparison to others. I sighed heavily. “Sixteen, Sophie darling. He’s very tall for his age; I didn’t have time to tell you, I’m sorry. It’s been a difficult time” she replied, “he’s not been staying with me long since…“ and she broke off and and turned to the end of the table to see that Tim had left Paul sitting there, gazing out the window over the garden. “Since what?” I ventured, curious as to what she meant. It was turning into a nice morning with some sunshine, so in the hope that we might be able to talk later, I suggested that some fresh air would suit everyone. The suggestion was met with very mixed reactions as it turned out that only Paul wanted to get out and about. By the time he left with a small hand-drawn map to walk into the village and look around, and by the time Emma and Katie had muttered they had some secret squirrel stuff to do and drifted upstairs with sellotape and scissors, I’d forgotten about my aunt’s unfinished remark and we simply cleared the table and stood together at the sink, overlooking the garden, she washing cups and odds and ends as I loaded everything else into the dishwasher. It was a very domestic scene, and as we chatted I found myself warming to my aunt in a way I had never done before. I learnt the whole sordid story of her husband’s affair, and the crushing depths to which she had fallen in the past three months before he finally walked out. I hardly knew Vincent, but my memories of a thin balding man with a vicious tongue seemed fully borne out by his actions. I wondered if my aunt was going to go back to a scene of unmitigated spitefulness or whether matters would run aground on a gentler slope of mutual distrust and animosity, but it seemed ghoulish to find out more so quickly so I changed the subject to Christmas and presents, and when we had finished clearing up we went off with a cup of coffee in hand to admire our Christmas tree. It was only when she asked to look about the house that I realised with a start that my aunt was the first of our outside family to have ever visited us and suddenly I felt very proud of what we had accomplished. I wondered what she would make of the small group of people we had invited for a New Year’s eve dinner – it would give her a better understanding of how our lives were turning out, at least. It wasn’t until late morning that I went into the village to pick up our bûche de noël, and as I went into the bakery I couldn’t help but remember another Christmas when I had fainted with shock onto that same floury floor. It was warm and cheerily bright as normal inside the shop, and I waited patiently for either Robert or Nadia to appear as the doorbell tinkled into silence behind me. It was Robert who appeared from behind the scenes, and after exchanging greetings I asked after Nadia and the little boy, as one should. There was a long silence as Robert looked at me, worry lines creaking at the corners of his smile. There was something wrong, I could tell instantly, and I asked the question, hesitatingly, concerned for both Nadia’s frail mother and the young child. “No, no – it’s not that, Sophie,” said Robert in slow and clear French for my benefit. “Nadia is unhappy, she las lost something of great sentimental value and I fear our Christmas will be ruined without it.” He shrugged his shoulders in sorrow and defeat. “Oh!” I put my hand to my mouth and gasped out, “It’s not the earrings is it?” An image of Nadia’s glinting ears, serene contentment and happy smile slipped across my mind. Robert jerked his head towards me in surprise. “You know about the earrings?” he asked incredulously. At this finality, he seemed to shrink and his eyes narrowed; so much so I wondered if he was going to cry. He looked at me, and I knew I was going to have to push the answer; “How about we all come here after lunch and Nadia shows us where she went?” I had a million things to do at home but suddenly finding the earring seemed immensely important. There was a firm nod of the head, and I wondered how the evening would end up at midnight if Nadia did not find her earring in time. “Okay, I’ll bring the gang past at 3.00 o’clock,” I said, and after accepting the long white box of delicious bûche de noël, closed the door behind me before stepping out into the street. I knew Simon was going to have to fetch the turkey from town that afternoon, I was going to be on my hands and knees searching for a needle in a haystack. Lunch passed in a blur of cold meats, cheese and baguettes; slices of tomato, a bowl of olives and green salad leaves littered the table as we discussed the search party tactics. The weather was warm and sunny, and it seemed everyone was up for a walk, even Simon, who said he’d pop into town afterwards to pick up the turkey. Plates stacked and the table wiped, we donned shoes, boots and sweaters and set off for the bakery, Paul bringing up the rear as he lingered, peering into windows and over fences into yards. The two girls dragged Dad and Tim along and I clumped cheerily across the old flagstoned pavements with Sylvie. I’d told the whole party about the legend of the earrings at lunch and my aunt seemed strangely quiet as I pointed out the church on the far side of the river. There weren’t that many people on the street and we stopped in the middle of the road by the old bridge and looked across it to the tower on the far side, set up on a little hummock, surrounded by a carefully pollarded group of plane trees. “Oh my,” she muttered, “that’s absolutely ancient.” There was a pause, as she thought more. “Almost as old as my local church.” and she turned to me with a wicked grin. “Shall we crack on to the bakery?”, and so we did, Paul still acting as a slow rearguard. I scuttled into the bakery to see who was ready, and found Nadia and her pram, waiting by the door. We exchanged kisses and greetings, and she thanked me for the support, and we left the shop and joined the others standing outside. I was about to introduce her to Sylvie and Paul when she stopped and stared hard at the young man, who started to blush. “Does he speak French?” she asked me quietly in her soft southern accent, everyone quietening at the tone in her voice. “I’m not sure,” I replied, slightly startled. “Do you want me to find out?“ but she interjected herself. “Parlez-vous Français?” she demanded of Paul, and he nodded, replying with a hesitant, “seulement, un peu”. There was a mix of reactions to this information from everyone, including Paul, who nodded. “Yes, I did, I’m sorry. I wasn’t looking where I was going, I’m really sorry.” and he blushed even more. Nadia turned to me, her eyes accusatory in their brilliance, “He nearly knocked the pram over,” and at that moment a thought struck me; was Sylvie’s half-finished remark a coincidence? I looked across at my aunt and saw her watching her nephew closely, her mouth open in wonder, too. Another thought crossed my mind, and the horribleness of it made my mouth go dry. “I didn’t do any harm, did I?” asked Paul in a mournful tone, and I noticed yet again that he was unable to look Nadia in the eye. I wondered whether it was due to shyness or something else. “I was watching the fish under the bridge,” Paul said, ruefully, “the water’s really clear and I could see lots of them.” He looked up at her very briefly before adjusting his gaze again so he could look elsewhere. The whole exchange had barely taken a minute, but Simon interrupted the undercurrents of accusation and remorse with a reminder we should really get on. Paul turned away with a lowering of his shoulders in what seemed despair, and I deliberately asked Nadia as to her route and where we should all be looking. A minute later we were going slowly down the road, a mix of young and old eyes on both sides and Tim and Paul in the middle. Turning left we headed down to the bridge, back the way we had just come. It wasn’t until we were halfway across the bridge that I sidled over to Nadia and asked her where Paul had bumped into her. She pointed with her chin in a typical gallic fashion to a spot ten yards away, where a bench sat on the broad pavement, almost in the centre of the bridge. “Just there,” she muttered, and I spent a good minute looking under the bench and the scattering of debris that was lodged behind it. Nothing. We carried on carefully down the other side of the incline and up to the church, good-natured chattering echoing amongst the trees. Nadia was looking very sad at the state of affairs and her face grew longer and more mournful to the state that by the time we arrived back at the bakery I fully expected her to break into tears. “Perhaps it is somewhere in the bakery?” I suggested gently. I motioned for the others to carry on back down the road homewards as I went through the doorway with her. Nadia turned slowly to me, “You think so? I have looked everywhere. Everywhere!” and she bent down to adjust the blankets in the pram. “Where else did you go, yesterday?” I asked. “Nowhere much,” she replied flatly, and then she put into words the thought that had been irking me. “I also,” and she had the grace to hesitate, “I wonder,” and there was another guilty pause, “I wonder if Paul perhaps has something to do with its disappearance?” The words had rushed out, and to be fair her thoughts echoed a small doubt in my mind too. I left several minutes later, aware that Nadia and Robert’s Christmas was heading to a sad climax if we couldn’t find the earring, but by the time I reached home I was aware that I had to ask a question or two of Sylvie and see if she couldn’t throw some light on the mystery. The house was quiet, and I saw the car was missing, so I knew Simon had gone to the butcher. It was so quiet I assumed he had taken everyone else too, but as I went into the kitchen I saw my aunt out in the garden, looking down towards the river. I opened the french doors and wandered down towards her, and as I reached her I saw her eyes were huge and sorrowful. I stopped, stunned, and reached out a hand to her shoulder. “Who?” I replied, instantly pretending not to understand. “Paul,” she whispered, “he didn’t steal the earring. I know he would’t have done that. He may have done some bad things in his life but he’s changed now, it wasn’t him” and her voice trailed off. My world spun a little on its smug self-satisfied Christmas axis of tinsel and decorations. “Oh!” I exclaimed, “What exactly has he done?” and I truly feared the worst. There was a long pause, broken only by the sound of the river and a raucous cackle from the rooks as they chattered high above our heads in the elms behind the house. I was aware that the grass was wet and wood needed to be chopped, incongrous things intruding on a moment of truth. I looked at her in horror, my heart sinking. This was my Christmas, my family, and my friends. I wanted to scream at the unjustness of the situation. Thoughts scurried through my head like leaves fleeing from a winter storm, I couldn’t contain them and they grew and solidified into an image of Nadia, standing alone in the night with a single earring and huge luminously wet eyes. “What the heck are we going to do now?”, I muttered, and at that my aunt finally burst into tears, with another cackling uproar from the rooks sealing the ghastliness of the whole affair. Another beautiful short story. Joyeux Noel. Lovely…..sitting enjoying the warmth of the wood stove….coffee with a drop of something special….reading your wonderful story. Hi Ali, thank you so much, hope you had a wonderful Christmas, maybe you will get snow in January? anxious for the next posting. What a delightful gift, thank you Susan, looking forward to the next instalment. Hope you all have a wonderful Happy Christmas. I don’t remember when or how I found your blog … but have enjoyed your posts for a couple of months now. Nice mixture of homely moments of pleasure and full enjoyment of where you live and the family you so obviously treasure! Yes, you are lucky. Today I clicked to read a story and had to force myself from the narrative to get my morning coffee – unfortunately the story says – ” continued next week” and me with a ‘still lost’ earring?? What happened? Anyway, enjoy your Christmas and I’ll tune in later.